B.G. is British Guiana; Bhagee is a fiery local stew. Philippa was the second daughter in a family of six children growing up in mid-20th century in colonial Guyana. She recounts her Sisyphean trials growing up a Carrington in Lot 10, First Street, Georgetown -- from the women's battles to the neighbours that never wore clothes to the relatives who walked with their shoes in their hands. Her stories come from a lost civilization of pre-independence stability just as the anarchic blessing of democracy came to the Caribbean. Her escapes came by winning scholarships -- first to Bishops, the prestigious girls' school where new trials and adventures awaited her, and later to Connecticut College. Guyanese born Philippa Perry studied in US and Canada, ultimately earning her PhD and becoming a Radcliffe Bunting Fellow. She lectured in Mathematics -- first at University of Guyana and later, for too many years, at Queens College (NY). 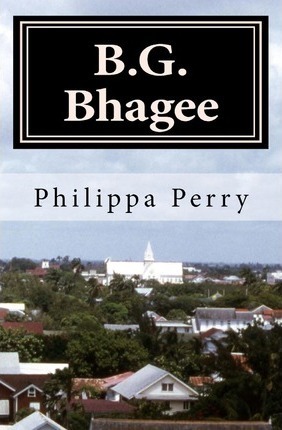 Philippa has returned often to Guyana, but, these days, primarily for funerals. She currently resides in Pound Ridge, NY where she spends her time chasing deer from her garden.